The Depository Trust Company (DTC) offers a wide array of services for processing corporate action events for the approximately 1.3 million active securities eligible at the depository. These services include announcing details of upcoming events and providing participants with information about their entitlements, accepting and acting on their instructions, and collecting, allocating, and reporting payments across various corporate action event types, including distributions, redemptions, and reorganizations. DTC offers full lifecycle processing of distributions arising from the servicing of the approximately 1.3 million active securities eligible at the depository, including cash and stock dividends, principal and interest, capital gain distributions, and other events. DTC offers full lifecycle processing of redemptions that arise from the servicing of the approximately 1.3 million active securities eligible at the depository, including full and partial calls, final paydowns, maturities, and other events. 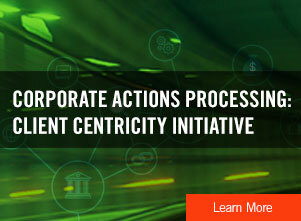 DTC offers full lifecycle processing of mandatory and voluntary reorganizations arising from the servicing of the approximately 1.3 million active securities eligible at the depository, including exchange offers, conversions, Dutch auctions, and other events.